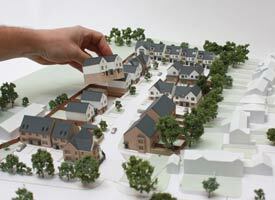 We are a Gloucestershire based architectural model maker and work for clients all round the country. Architectural models are used to great effect in the selling of your designs. They are appealing to clients aesthetically while also conveying valuable information of your designs. Architectural models can showcase your key design features for your clients at all stages from concept to planning to sales. Scale. 1:200 is the most common scale as you can achieve high architectural detail and get a good impression of the topography. 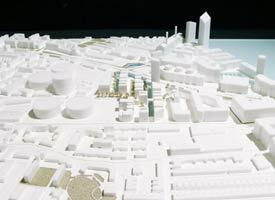 1:2000 is common for master planning at low resolution. Style. We make block models, high detail, partial colour and also full colour models from a mix of materials. Laser cut acrylics, timbers, card and also 3d printed elements can be integrated to achieve modern or natural styles. Information. For a quote we will also ask for: Site plan with model boundaries highlighted, the required size or scale, building plans and elevations, CGI’s if available, topographic information if required. Simple monochromatic block architectural models show initial concept plans and a buildings context to it’s surroundings. These can be modern gloss acrylic, solid timbers or low budget foams depending on your budget and stage of development. Scale: 1:2000 scale models are common for master planning at low resolution. 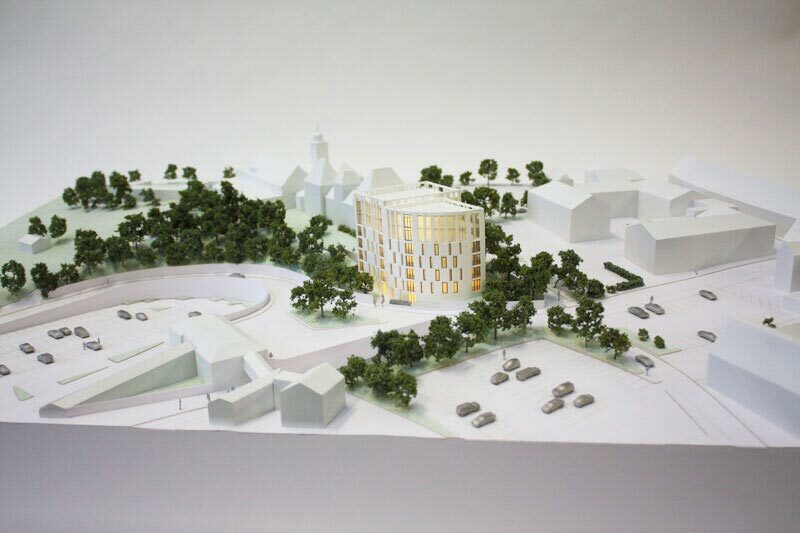 Block massing models can also be animated with trees, colour and topographic information. We know the key element in planning applications is accuracy and detail. This is achieved using a range of modern machinery and also traditional techniques. Laser cutting cuts with 0.1mm precision and high tolerance acrylic from 0.5mm thickness allows us to achieve very delicate cutting. Finer details like brickwork and stone effects can be picked up with engraving to give extra texture to your model. If you require the topography to be shown to a high accuracy we can also use CNC milling to produce a contoured base. Full colour or partial colour architectural models are brought to life with more realistic coloured representations of materials and finishes using paint techniques, flocking and also etched velum trees as required. 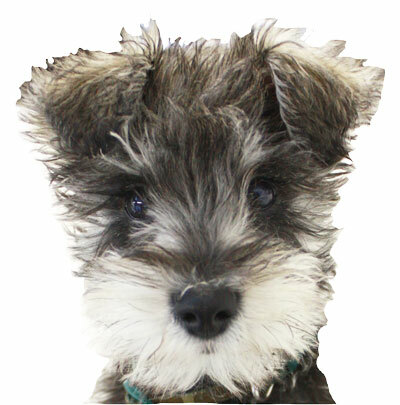 Sales models look great in your marketing suite and aid in the understanding of the plots for customers. They are usually full colour and with a high level of detail. We can use your 2d designs and plans to create high quality 3d models. We can also integrate led lighting to highlight specific plots. We use laser cutting and paint finishes to create a quality finish. If you require the topography to be shown to a high accuracy we would use CNC milling to produce a contoured base. 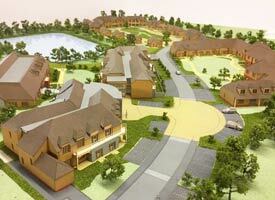 Take a look at some of our previous work for examples of architectural models. What information do we need for a model? – A site plan with model boundaries outlined. – Topographic and landscaping plan of the site. – Plans and elevations of all buildings to be constructed. – Relevant images/photos showing building materials. – What scale or size model you require. Do get in touch to discuss your project even if you don’t have all the information available currently. We are a Gloucestershire based model makers however we work all around the country for architects and private commmission. Do contact us to discuss any aspect of your project. What scale model you are looking for. Overall scope of the model (google map image with a box showing the area is ideal). We can make architectural models at any scale and tailor the style and materials to match your exact requirements and budget. Contact us to discuss your unique project.